Houston Bush Intercontinental Airport, Terminal D- Houston Texas. International carriers including Air France, Aero Mexico and British Airways are among many airlines that land and depart daily from Terminal D’s 12 gates at the George Bush Intercontinental Airport in Houston, Texas. When an existing SBS modified bitumen roof system on the terminal succumbed to years of exposure to jet fuel residue from these planes, the City of Houston looked to FiberTite Roofing Systems by Seaman Corporation for a more durable long-term solution. PGAL, a Houston based architecture firm, recommended FiberTite to the City because of its excellent results when tested in jet fuel. 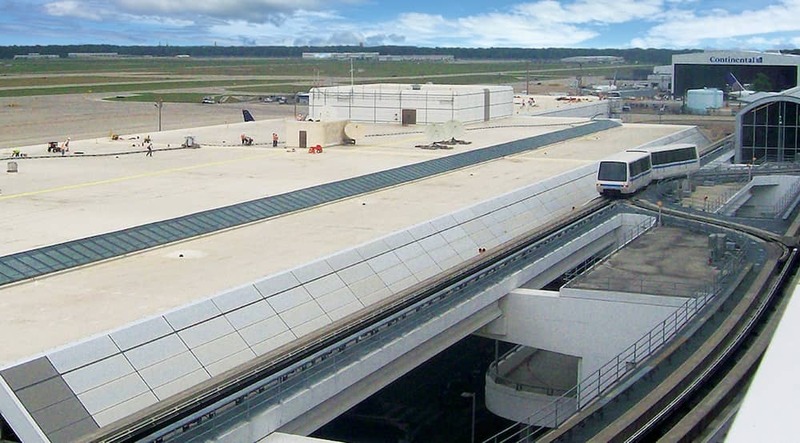 FiberTite has a proven performance history of lasting more than 20 years in high traffic airport installations. Airport roofs have to endure jet fuel, and also the grease exhausted onto the roof from the airports’ food courts. Houston’s weather conditions gave the architect additional concerns. Hurricane Ike, the third costliest hurricane ever to make landfall in the U.S., hit Houston in the summer of 2008 and contributed to the final failure of Terminal D’s old modified bitumen system. FiberTite’s proven track record includes numerous instances of outlasting major hurricanes, as well as tornadoes and significant hail events. Additionally, the City recently implemented new building codes that require new roofs to be energy efficient. Houston’s high temperatures stray far from moderate. Seaman Corporation was one of the first roofing manufacturers to label its product under the Energy Star roofing products program. The Cool Roof Rating Council gives FiberTite roofing membranes one of the highest scores in the industry for solar reflectivity and infrared emittance. This translates to an annual cost reduction of between six and forty-one cents per square foot, in the continental U.S., depending on geographic region. Chamberlin Houston, Ltd., an authorized FiberTite applicator, installed the FiberTite system that protects the 220,000 square foot terminal. Given the airport’s high level of airline and passenger activity and heightened security requirements, the task was not for amateurs. The contractor has several decades of experience working for the Houston Airport System. Chamberlin orchestrated a project schedule that met strict airport safety protocols and minimized disruptions for travelers. They engineered trash chutes and a freestanding stairwell that could withstand hurricane force winds. Most of the work took place between the hours of 4:00am and 12:00pm.